I was really afraid for you when I read your story. I am happy you survived. I have this nagging question, I was abused in sort of similiar ways that you were. I finished therapy seven years ago. I did well for about four years and have recently slipped back. I feel suicidal all the time and hate the idea of calling my old therapist. Would youʼve called your old doctor if he was still alive? I heard in a news report that Richard Baer died last year. I am sorry for you. I would like to talk to him but donʼt know if heʼll remember me. I had D.I.D. and was in thereapy for six years. I didnʼt have alters like you. I dissociated myself. I’m sorry to hear that you have also been abused. I can understand how my story made you afraid, not only for me, but for what you also experienced. I assure you my doctor, Richard Baer, is alive and well. 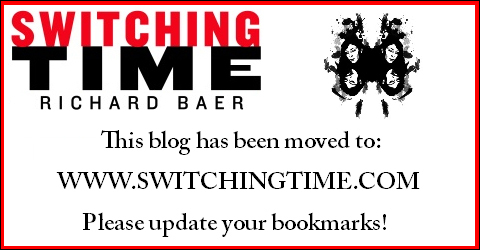 There are hundreds of Richard Baers, and coincidentally some are writers and authors, however the Richard Baer that wrote Switching Time is still here. I read of another Richard Baer that died last year, and I believe he was an author of another series of books, and no relation to my doctor. Yes, I would call my former therapist if something changed and caused me to feel suicidal again–and I have. Please do seek out and call your former therapist to see if he’s still in practice. If he isn’t, he may be able to refer you to someone who has taken on his patients. I’m sure your doctor will remember you, especially after treating you for a rare dissociative disorder for six years! The therapeutic relationship is not so easily forgotten. It’s important that you seek professional help while you are feeling suicidal. I am not a therapist and can’t give advice, but I wonder if something may have triggered your relapse, and who better than your old therapist to help you get back on the right path. Whether you chose to see him or not, it’s important to talk to someone who can help you. It’s not too late! You are full of fascinating stories! I read your answer about the hand accident and how you got you driverʼs license. I barely got my license just being me. What a way to go? I bet Holdon took the whole class. How do you think you passed the test? Do you recall any part of the drivers ed class? I think its great how you just did it, took the test and all. Did you buy a dress that day for the wedding you were going to? Was it Holdon who picked out your dress or did he just drive you to the mall? If I knew you I would kiss the ground you walk on. Sweet Jesus you are awesome! Donʼt get insulted but you really had me and my husband laughing. Thank you for your interest in the daily life stories of my alters. There are hundreds of such stories, because with seventeen alters there was always something going on! Regarding who took the driver education classes, that would be Karen 3 with Holdon and a few of the alters “watching”. The knowledge about driving I acquired would come through one alter, and once known, would become known to most of the other alters as well, as long as the information didn’t need to be walled off. It’s kind of hard to know how involved any one part was because after integration, I received all these memories and now I experience them as my own. Yes, I did buy a dress that day, and loved it! It was dark red and very feminine, and special to me. Holdon, being a male alter, had no interest in shopping, however the choice was not mine alone. I had alter help. Remembering that day brings a smile to my face. As a matter of fact, I have a picture of my husband and me when I was wearing that dress. I’m glad about the laughter you shared with your husband. I laugh at many of the things my alters have done, too! As I look back and recall these stories I find a sense of calm and appreciation for each and every alter that was born. Laughter really is the best medicine. Thank you for all your compliments. MPD? DID? Who cares what it’s called? It’s the same. I had read Switching Time and it’s very informative. My question is why isn’t Richard Baer doing anything to help this book along? If I were him I’d be talking this week with the introduction of the new series USOT. What’s wrong with him? Did he die or something or simply doesn’t give a damn anymore? I assumed he was after a cause to improve the medical field and lives of patients who suffer. Are you really a professor? If so, you should know that Dr. Baer has done quite a lot for the book. Switching Time was published in October, 2007. We’ve been fortunate to have had much publicity: Good Morning America, Newsweek, Fox News, Chicago Magazine, NPR, and many other radio and print interviews around the world. Could it be that you’re searching for something more recent? Dr. Baer and I are always willing to do more to share our journey. Switching Time has been published in several countries, and all this information is listed when you Google our book. Of course, there is added interest this week with the new series The United States of Tara. But if you look, there is plenty of information already available on Switching Time to satisfy those who are interested in reading a true story. Dr Baer is well and moving on with his life. He continues to be interested in and care about those who suffer from this illness. We will both always be available to publicly talk and discuss our work together.